Carlson Super Wide Pet Gate Review – Charlie and his time in the sun. This post is sponsored by Carlson™ Pet Products. I am being compensated to help share the Carlson Super Wide Pet Gate, but we only share information we feel is relevant to our readers. Carlson™ Pet Products is not responsible for the content of this article. In case you hadn’t noticed we have puppies at the house all the time. Raising puppies is fun! It’s exciting! but puppies are also very mischievous. They can get into a lot of trouble if you don’t keep a close eye on them. One of our favorite brands, Carlson Pet Products offers a variety of containment products including pet pens, gates, and crates to help keep puppies out of trouble. When it comes to keeping our pups out of trouble we love our crates and pet pens, but we also like using gates to control and contain our puppies. That brings us to today’s Carlson Super Wide Pet Gate Review. DISCLAIMER: This is a Pet Gate. NOT intended for the use with children. We have used our Carlson Super Wide Pet Gate with our daughter under supervised circumstances, but the Carlson manual clearly states that it is “NOT intended for the use with children”. 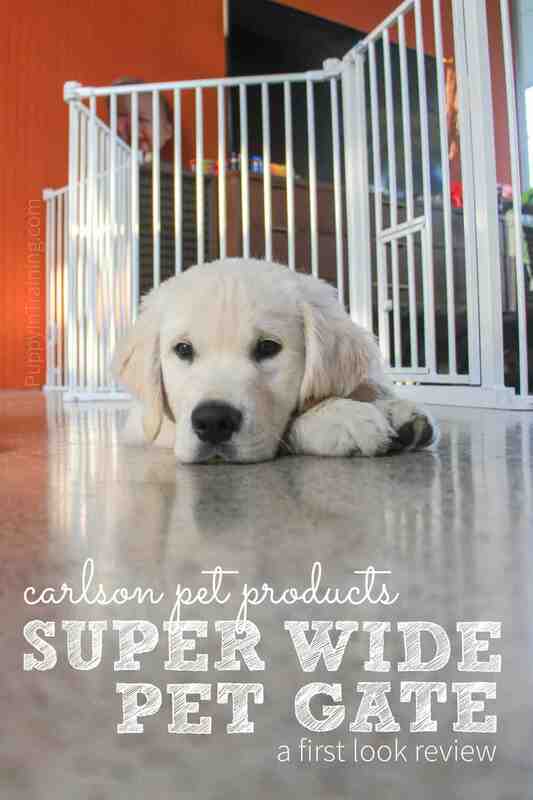 Lets start out with the specs for our Carlson Super Wide Pet Gate. 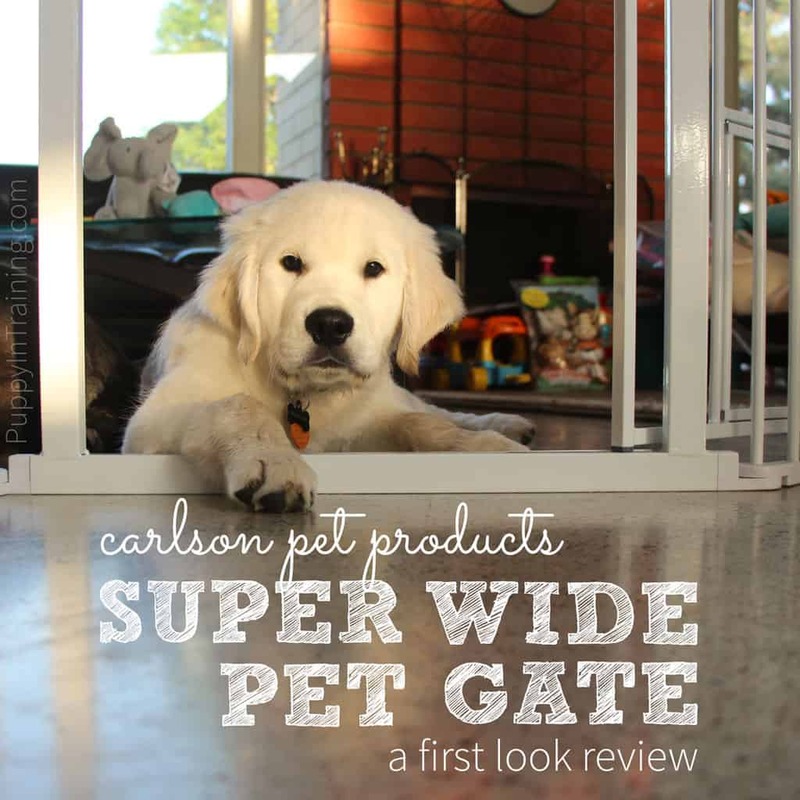 First Look: Carlson Super Wide Pet Gate Review – Charlie gives thumbs up! The Carlson 120” Super Wide Pet Gate mixes functionality with convenience. Featuring a 100% steel frame, the gate installs to the wall in minutes and includes five removable 24” panels arranged in an accordion style shape. To truly accommodate large openings, the flexible hinged posts allow the gate to configure for multiple openings and can span up to 120” wide. That’s 10 feet wide! With a gate expanding that wide, installation seems like it would be a hassle. To the contrary, the super wide gate installs in minutes. Simply attach the mounting hardware to the wall and slide the gate into place. Standing 28” tall, the Carlson 120” Super Wide Pet Gate can easily be moved around and configured to be a fireplace barrier, a gate for a super wide space, or a barrier to block odd shaped openings. If you need to create a larger gate or play yard, more 24” extensions (above and beyond what is included) can be added. Additional extensions are sold separately. With such a large pet gate, a walk through door is a must. Equipped with a 16” door, adults can pass through by simply sliding and releasing the safety lock and lifting up on the handle. The design is an invaluable benefit compared to stepping over the gate every time. Because you may not want the gate up at all times, the Carlson 120” Super Wide Pet Gate is lightweight, portable and folds accordion style to stow compactly. 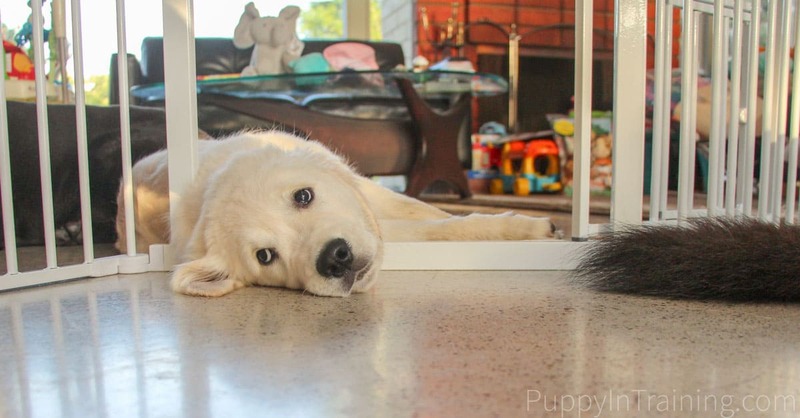 Enough of the Carlson specs…you’re probably wondering what do I think about the Carlson Super Wide Pet Gate? It’s big…and I mean BIG! It’s 120 inches wide and while I haven’t tried yet, I heard you can add more panels to make it even larger. That’s pretty cool. Easy setup – I literally had our gate setup in minutes. Dog barrier for indoors. This was our intended purpose for our gate. Basically we wanted to keep the dogs out of Emma’s play area in the living room. So far it’s worked out marvelously. A puppy play pen. It works great as a gate or a pet pen. We plan on using our new pet gate with our next litter of puppies. Cat door – My mom definitely gives it thumbs up for the cat door. The door latch – The door latch is simple to open and close. Why is this a big deal? Many of the dog gate latches we’ve encountered at our fellow dog lovers homes are nearly impossible to open. Customer Service – My gate came sans screws for attaching the gate to the wall. I contacted Carlson and they were very responsive getting a new set of screws in the mail the same day. Honestly, there’s very little I’d change about our new Carlson Super Wide Pet Gate. The door latch – this is me nitpicking. I love the door latch because it’s simple, but I’d also change the door latch because it’s simple. I know this is a pet gate and not a child’s gate, but my 15 month old daughter seems to be on the verge of figuring out how to “release the hounds”. Packaging/Delivery – Ours was missing the screws. I think something happened either during packaging or delivery. However, I contacted Carlson and they quickly sent me a new set of screws to attach the gate the wall. Could it be sturdier? Maybe, but it’s been sturdy enough for my three adult dogs, one puppy, and even our 15 month old baby (if you need a gate for a baby then try visiting Carlson’s sister company, a baby brand called Regalo ). Could it be larger? Maybe, but you can add more panels if need be and if you’re looking for a larger gate from the get-go check out this Carlson product. I guess my biggest issue is I wish I had more than one. Off the top of my head I can think of 3 great places in my home to use these Super Wide Pet Gates: One in the living room. One in our side/kitchen room. And one in our side yard. Our Carlson Super Wide Pet Gate arrived a couple days before we sent Charlie off to Service Dog School and unfortunately, we did not get a chance to let the puppies thoroughly test our pet gate. Hopefully we’ll have a litter of puppies to test our Carlson Pet Gate in 2019. We did give the older dogs (The late Linus, Stetson, and Raven) and baby Emma a chance to test our new gate and it passed with flying colors. Yes, the pet gate did it’s job and kept the dogs out of our living room area and also kept Emma in her play area. I know this is a blog about puppies and dogs, but I have to tell you, Emma probably used the gate more than any of the dogs. She practically learned to walk surfing our couch, coffee table and the Carlson Super Wide Pet Gate. Back to you. What did you think about our Carlson Super Wide Pet Gate Review? Have you ever used pet gates with your puppy? If so, tell us about your thoughts and experiences in the comment section below. So, nice gate and everything, but I just can’t get over what a cutie Charlie is!